Lighting A Revolution: Ink Blotter 923, "Light up .. for cheerfulness"
"Light up .. for cheerfulness"
Blotter number 923; image number: LAR_B923. "Light up .. for cheerfulness. A door flung wide; warm light from within to bid cheerful welcomenothing so adds to a home's hospitality at do little cost as proper lighting." "Agents for Edison Mazda Lamps, General Electric"
People attached great symbolic meaning to light long before the invention of electric lamps. This has been especially true in portraying domestic scenes: the romance of a candlelight dinner, the shared closeness of family and friends gathered around a fireplace hearth. 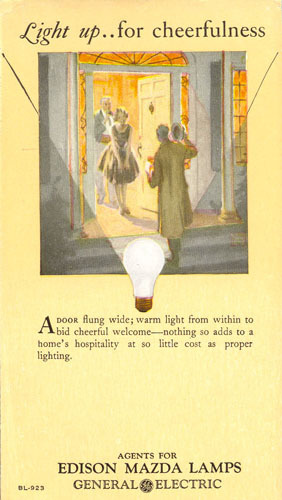 Or, as seen in this blotter, the "cheerful welcome" conveyed by a "warm light from within." Whether used in art or advertising, lighting can evoke strong feelings of home. This blotter dates from the late 1920s or very early 1930s. The modern shape of the bulb shown (known in the industry as the "A-shape") came into use around 1925, and GE phased out the use of Edison's name after the inventor's death in 1931. A push to raise light levels is seen in most companies' ads in this era. This push, combined with the effects of the Great Depression, culminated in an industry-wide sales campaign called "Better Light - Better Sight" beginning in 1933. Nineteenth Century, trans., Angela Davies (Berkeley: Univ. 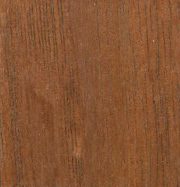 of California Press, 1988).